Bob Moriarty: Stock Market Crash Coming, Marijuana Stocks Are The Next Bubble | Energy and Gold Ltd.
321gold founder Bob Moriarty gets it right more often than not. He absolutely nailed the top in Bitcoin in December 2017 and he’s called about 5 or 6 of the last 7 important turning points in gold stocks during the last couple of years. However, he would even admit he was wrong in his call a few months ago that we’d get a tradable rally in gold stocks in July. A rally in gold mining shares has not materialized and recently we’ve seen gold meander around the US$1200 level while silver has been mired in the low US$14s. In Energy & Gold’s September 2018 conversation with Bob Moriarty we get Bob’s latest thoughts on the state of the precious metals sector, his thoughts on some individual names (including Aben, Bayhorse Silver, Group Ten Metals, and Novo Resources), in addition to his thoughts on the broader stock market and the hottest sector in the stock market right now (cannabis). Goldfinger: Let’s start talking about the gold miners. We’ve seen a tiny bounce in gold, about $50 from the mid-August low around $1167, but the miners aren’t doing much. For all intents and purposes the goldies are right near 52-week lows. It feels like a lot of things are lined up for a countertrend move in the precious metals sectors – are we going to finally get a substantial rally in the goldies? Goldfinger: How would you play it? Do you buy select names or can you just buy the sector ETFs? Bob Moriarty: Juniors miners have been indiscriminately sold off as a sector and that means that they will eventually rally as a sector. There are a lot of miners that are near 52-week lows and we’re in the time of year where typically we get a rally so I think you can buy a lot of different precious metals mining shares and do well. Goldfinger: It’s always difficult to have a crystal ball but how much upside in gold mining shares do you think is possible from here? Bob Moriarty: I’m not very good at calling prices but I am good at calling turns. This is going to be a good time to be invested in gold, silver, platinum, rhodium, and the mining sector ETFs. I believe we’re going to have a very strong snapback rally. Goldfinger: Drilling down a bit more into specific stocks, this year we’ve discussed several stocks including Aben (TSX-V:ABN) and Novo Resources (TSX-V:NVO). Do you have any insights into Novo and this waiting game that shareholders have been faced with in 2018? Bob Moriarty: It’s 100% in the hands of SGS for Novo Resources in Australia, and they have done an absolutely terrible job of setting up a small test facility. I do think there’s going to be a lot of news from Novo in the next month and I think it will surprise everyone and there will be a big move to the upside in NVO shares. You also mentioned Aben, they should be coming out with results any day now. I think there will be a lot of news coming out of the Golden Triangle in the next few weeks and I think it will largely be good news and the market will react positively. Goldfinger: We’re seeing a theme this year that we’ve also seen the last couple of years and that is companies are overly optimistic in terms of when they’ll have assays and put out news to the market. It seems that every single junior mining company that had a summer drilling program is now waiting for assays to come back from labs and the assays are late. Does it concern you that these late assays could permanently damage investor sentiment in the junior mining sector? Bob Moriarty: There have been a lot of investors who have left the sector and they probably won’t come back until there’s been a significant rally. I believe that investors who are patient in the best names like Aben and Novo will be rewarded for their patience. Goldfinger: Another trend that appears to be even more pronounced this year is selling a company’s shares as soon as they announce news, even if it’s considered to be positive news. We’ve also gotten a lot of leaks as to what news will be, drill results have been leaked for a number of companies and we see the stock’s move before the company releases the NR. Then the shares sell-off once the rumor is confirmed. Bob Moriarty: It’s very common when you’re in a declining market to have news releases and/or promotions turn into liquidity events. Really good news will come out and the stock will drop, this is because there are people who are waiting to sell but they can’t sell due to insufficient liquidity. News creates increased liquidity and it doesn’t matter much what the news is, because these people have made up their mind that they want to sell. There are a bunch of examples of this recently, including several names that i’m following. Goldfinger: Which stocks are your referring to Bob? Bob Moriarty: White Gold (TSX-V:WGO) would be one of them. One of my favorite guys in the junior sector is Shawn Ryan, he vended a bunch of his Yukon assets into a company called White Gold that can count Kinross and Agnico-Eagle each as 19.9% shareholders. White Gold is being valued at $41/ounce in the ground with a 1.2 million ounce 43-101 compliant resource in one of the best mining jurisdictions in the world. I wrote a piece about White Gold a few days ago and the stock dropped. This makes no sense. Goldfinger: The problem with the juniors right now is that the macro players are not involved at all, we’re basically seeing shares getting traded around by the same small group of market participants and there are a lot of participants who are only interested in making quick trades in junior miners, they are not long term investors because they don’t want to sit through the winter in companies that can’t drill for six months. Switching topics a bit, do you believe that there is manipulation in the precious metals market, that central banks are intentionally suppressing the prices of gold and silver? Bob Moriarty: There has been a lot of information recently stating that central banks have been net buyers of gold since 2008. So instead of suppressing the price of gold, they have actually been supporting gold. GATA and the people pushing the price metals price suppression conspiracy theories are telling people what they want to hear but it is not based on the facts. If you really believed that gold and silver are suppressed you’d be insane to buy it, why would you buy a commodity because it’s manipulated? Goldfinger: Let’s turn to the broader equities market. 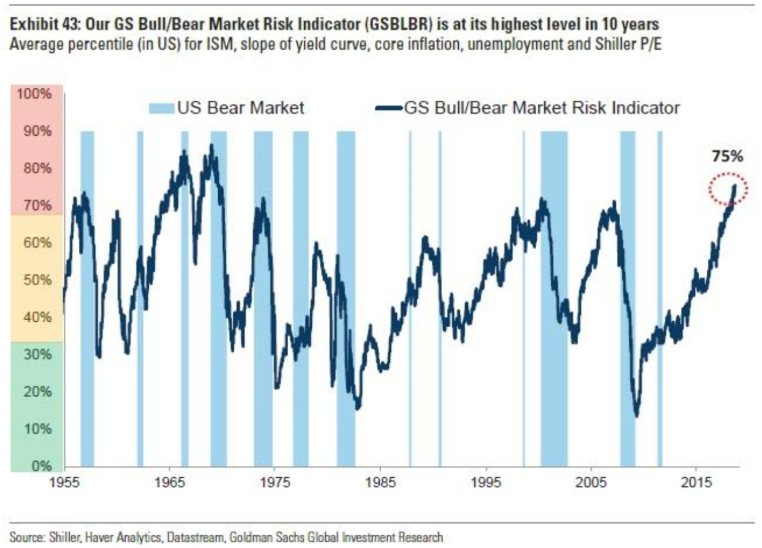 US large caps are basically at an all-time high, trading at an historically very high P/E multiple (25x vs. historical average of 17x), the Goldman Sachs Bull-Bear ratio is at a multi-decade high (above where it was in February 2000 or October 2007) and there are many other indications of extreme readings across the US equity landscape. We have also seen base metals (copper, nickel, zinc) roll over, meanwhile, the broader equity indices have remained unphased. Base metals like copper have often proven to be a leading indicator for equities, however, the herd seems to think that it’s different this time. I haven’t seen as many warning signs as i’m seeing now since the summer of 2008. Bob Moriarty: Your sense is absolutely correct. There’s been a liquidity crisis going on and that is what has been weighing on gold mining shares and the base metals. But first let’s go back to 2008, there were a half dozen mutual funds holding precious metals mining shares at the time and those funds had large redemptions which caused a cascading decline in junior mining shares (during the final few months of 2008). Those mutual funds don’t exist anymore so people are really just selling because they’re bored and they’re afraid of what might happen. The number of red flags waving across the overall market is absolutely staggering. Now the first time I ever saw a market crash was in 1969, back then there was a group of stocks called the “Nifty Fifty” that kept going up even when everything else was going down. One of the last things that happens before a major top is an extreme divergence in which the market leadership narrows. Today we have 50% of the market’s trading volume is in the FAANG stocks (Facebook, Amazon, Apple, Netflix, Google) and that is the biggest warning of a major category 5 hurricane in stocks that you could possibly have. I believe that we’re going to have a major market crash in September or October, and we spoke about this a couple months ago. You’re going to either need to be very liquid or very patient because it could turn out to be a really great time to be a buyer of junior mining shares. Goldfinger: I think that’s a great point about the market leadership narrowing and the enormous concentration of trading volume in stocks like Amazon and Netflix. What happens if these stocks stop going up? Bob Moriarty: Back in 1969 we had the Nifty Fifty which was essentially the most popular 50 large cap stocks on the New York Stock Exchange, now we basically have the “Nifty Five” with ½ of the market’s trading volume in five stocks. That’s the most dangerous market environment in history. Bob Moriarty: If you take into account the situation in emerging markets and in the bond markets you’ve got a potential for armageddon. I’m not predicting armageddon but I think there’s a chance that it could happen, possibly in September/October. Goldfinger: You called the cryptocurrency bubble about as well as anyone possibly could have, and we’ve seen an absolute devastation across the board in the crypto sector this year. We’ve got another mania currently percolating, this time it’s in cannabis stocks. What are your thoughts on the cannabis sector? Bob Moriarty: It’s just another bubble. We forget this but the fact is that everything goes into a bubble eventually. It happened in silver, it happened in gold, it happened in real estate, it happened in bitcon, and now it’s marijuana. I think a good indication is when something is in the news every single day, it means it’s time to sell and all of the gains are behind you. Remember bitcon in October/November 2017? It was something people had ignored for years and suddenly literally everyone was talking about it all the time. What I find so funny is that after I called the exact top in mid-December 2017 and I banged on the table on several occasions over the next several weeks and called it exactly right there are people who still say that i’m an ignorant fuddy duddy old fart who doesn’t understand technology. Well that may be true, I am a fuddy duddy old fart but I do understand people and I do understand bubbles. And i’ll say right now, marijuana is a bubble and I wouldn’t touch it with a ten foot pole. Goldfinger: Which stocks would you buy right now and are you still more bullish on platinum and silver than gold? Bob Moriarty: Relative to gold, platinum and silver have never been cheaper. Platinum is a real bugger, 78% of all PGMs produced come out of South Africa and they want to turn that country into the next Zimbabwe. Literally the country is committing economic suicide. Platinum and platinum miners are going to get real rare and real valuable. One of the best non-South Africa PGM juniors would be Group Ten Metals (TSX-V:PGE) in Montana right next to the Stillwater Mine. Excellent management and prospects. I’ve been buying a lot of Bayhorse Silver (TSX-V:BHS), it’s a giant sleeper. They are coming out with a 43-101 shortly and will be in production before you can shake a stick. I’d like to thank Bob for his time and insights and I know i’ll be eagerly awaiting some of those results from the Golden Triangle including Aben and Garibaldi, and of course anything from Novo is always of great interest. Until next time!